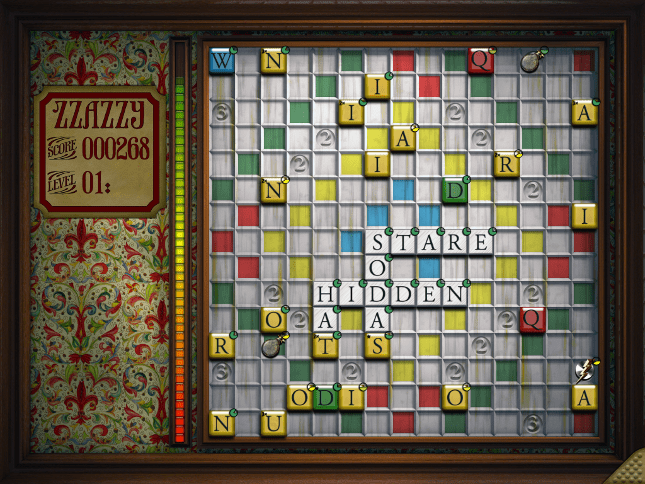 Zazzy is a word-based action puzzle game similar to a one player version of popular tile-laying board games. It features endless continuous play akin to the abstract puzzle games of the 1980s. The bar on the left is the game timer. When it is empty the game is over. Letter tiles randomly appear and the player must position the tiles in a legal crossword-style crossword grid by dragging them with the mouse pointer. A tile on the a board cell of matching color receives triple its point value. The 2x and 3x board cells are double and triple word scores. The remaining time in the game timer is increased proportionally to the point value earned by a successful lock-in and the player’s score is increased by the score value of a successful lock-in times a level multiplier. Locked-in tiles can be played off of but cannot be moved. Each tile has a pie timer widget on its upper right. When this timer expires, the tile disappears negatively effecting the global timer if the tile that expires is not locked in. Random tiles: Random tiles look like gray letter tiles They cycle through the alphabet until they are dragged the first time at which point they behave like normal letter tiles with no point value. Bomb tiles: When the user drags a bomb tile onto a group of connected locked-in or non-locked-in letter tiles, the target tiles will be destroyed without effecting the user’s score or game timer. Juice tiles: (appear as lightening bolt icons) When user drags a juice tile onto a group of connected locked-in or non-locked-in letter tiles, the tiles’ local timer widgets receive additional time. The game levels up after a certain number of tiles are locked in.